Depthmaster 3000 rides a sub down to 1300 feet in the cold, dark Bering Sea. 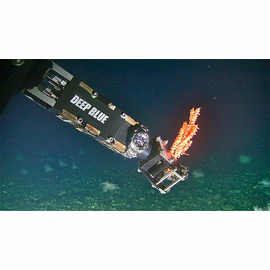 Deep Blue Explorer and sub pilot, Joe Lepore, strapped a Depthmaster to the manipulator of the Waitt Institute's Dual DeepWorker submersible. The Waitt Institute is currently at sea with Greenpeace exploring the world's largest undersea canyon off the coast of Alaska.